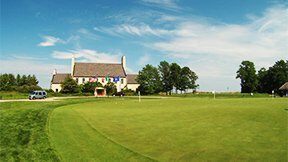 Looking for Sheboygan golf courses? Sheboygan County, Wisconsin has 16 golf courses. There's golf for every skill level and age group in your family! There's pro level golf courses at The Bull, Blackwolf Run and Whistling Straits. The Bull is Wisconsin's only Jack Nicklaus Signature golf course. Blackwolf Run has The River course and The Meadow Valleys course, both designed by Pete Dye. Whistling Straits has The Straits course and The Irish course, also both designed by Pete Dye. Whistling Straits is one of the few golf courses in Wisconsin, that's located on the majestic shore of Lake Michigan. There's family level golf courses at Evergreen, Quit Qui Oc, Riverdale, Sir Lanserlot, Sunset Hills and Town and Country. Evergreen and Sunset Hills golf courses are 9 holes. Riverdale and Sir Lanserlot are 18 holes. Quit Qui Oc and Town and Country courses are 27 hole golf courses. Sheboygan has a private golf course at Pine Hills Country Club. There's family fun golf courses like miniature golf at Harbor Pointe and Tom and Jerry's. The Frisbee Disc golf at Vollrath Park, Jaycee Quarry Park and H. A. Meyer Nature Park is free! Sheboygan even has indoor golf at Maple Lanes bowling alley, with a Full Swing Golf simulator. So take your family on vacation to Sheboygan, Wisconsin. Do some Lake Michigan fishing and try one of our many Sheboygan golf courses. You'll make family memories that will last a lifetime! Be sure to tell them the "Sheboygan Fishing Guy" sent you!! Pine Hills Country Club (Private) Website. Quit Qui Oc Golf Club Website. Sir Lanserlot Golf Course Website. The Bull at Pinehurst Farms Website. H. A. Meyer Nature Park Website.